Come plum season, I normally just eat plums as they are. In all honesty, I would have difficulty making a tart or a pie with plums and that is simply because I doubt that I could resist eating them raw — meaning that by the time I’ve chilled the dough there won’t be enough left for the filling. However, roasting plums is completely different. Roasting concentrates flavors, it brings out the best in pretty much all produce. Plums are no exception. This recipe (if you can even call it that) is as simple as 1, 2, 3. 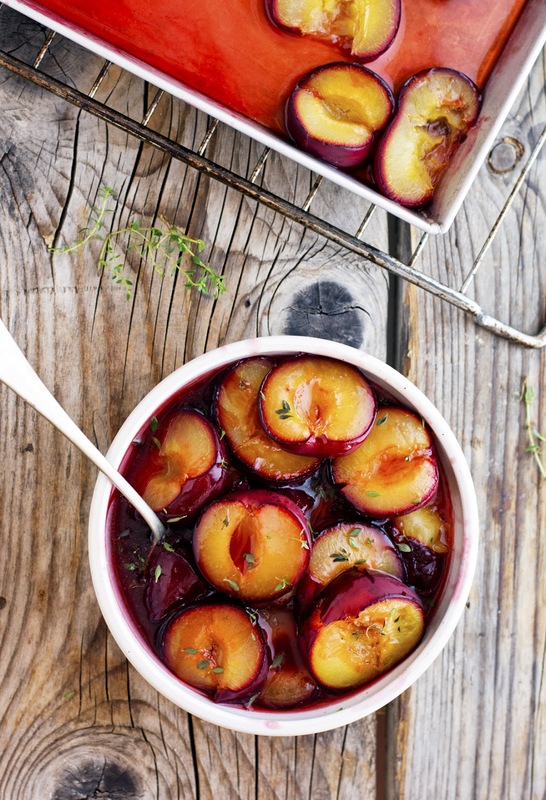 Cut the plums, drizzle ‘em with maple syrup and vanilla, and let the oven do the rest. The fruit comes out soft and juicy with background notes of vanilla and maple syrup. In one word: irresistible. You can serve them right away or store them in the fridge, and use them for breakfast, a snack or dessert. 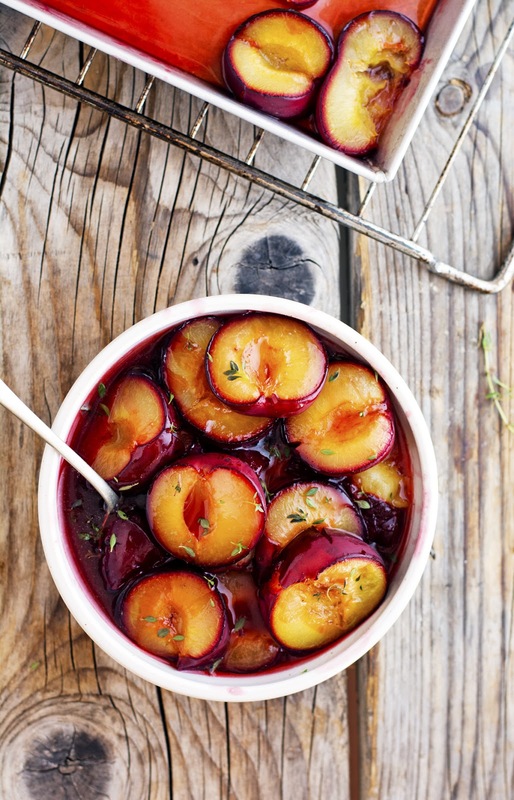 Simple Maple Vanilla Roasted Plums Print this recipe! One quick note regarding cooking time: I like to roast my plums until they are juicy and tender but are not yet collapsing completely. Feel free to adjust cooking time to your preference. Preheat oven to 450°F (230°C) and place a rack in the middle. Lightly grease a rimmed baking sheet. Set aside. Wash and dry the plums. Using a sharp knife cut them in half right through to the stone. Hold each half in your hands and twist them in the opposite directions to pull them apart. 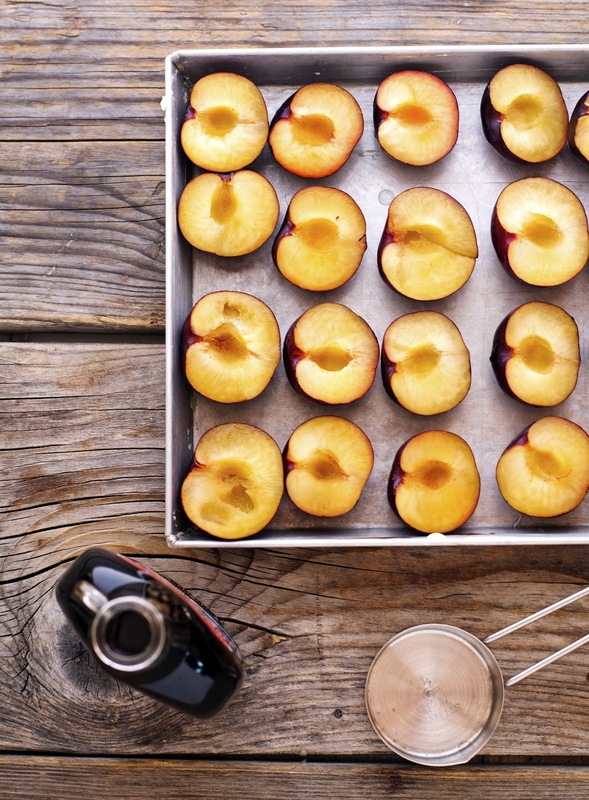 Place plums, cut side up, on the prepared baking sheet. In a small bowl stir the maple syrup, vanilla, and salt. Drizzle evenly over the plums. Roast for about 15 minutes, or until the plums are tender. Remove from the oven and leave them to cool in the baking sheet. As they cool, every now and then spoon some of the juices over the plums. Once cool, sprinkle with some fresh thyme if you like. 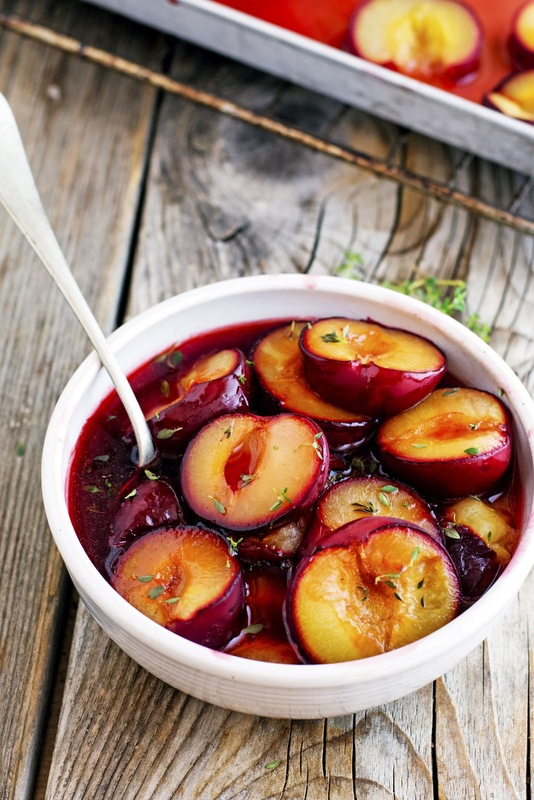 Transfer plums and their juice to a shallow container, seal, and store in the fridge up to 1 week. One serving yields 107 calories, 0 grams of fat, 27 grams of carbs, and 1 gram of protein. Drool city, population me. These look absolute DELICIOUS! Had so many peaches so used this recipe for them. Sooo good!